ELIHU ROOT. 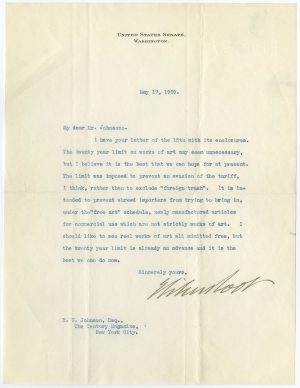 Typed Letter Signed as Senator, to Robert Underwood Johnson. Washington, D.C., May 17, 1909. On U.S. Senate stationery. 1 p., 8 x 11 in. In 1883, Congress tripled the tax rate on art brought to the United States from abroad as one of the many new tariffs on imported goods. The tariff was reduced in 1890 and then eliminated altogether between 1895-1897. However, the passage of the controversial Payne-Aldrich Tariff Act reignited the controversy by re-imposing the art tax but exempting works over 20 years old. Despite Senator Root’s assertion that the exemption was not intended to prevent artistic “foreign trash” from entering the United States, it did make it much easier to import Old Masters and other classical art forms than more contemporary (and controversial) works of modernism. The tariff provision of the Payne-Aldrich Act was ultimately repealed in 1913 after intense lobbying by the American Federation of Arts. Elihu Root (1845-1937) was a New York lawyer who alternated between government posts and private practice. He served as secretary of War (1889-1904), Secretary of State (1905-1090) and U.S. Senator from New York (1909-1915). He also served executive roles in various Carnegie foundations in New York and Washington. In 1912, he was awarded the Nobel Peace Prize for efforts supporting international arbitration and cooperation. Kimberly Orcutt, “Buy American? The Debate over the Art Tariff. American Art 16, Fall 2002, pp. 82-91.